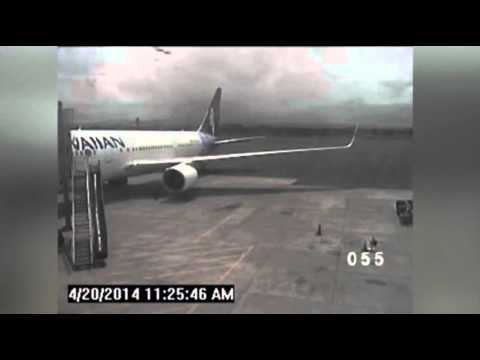 Published: May 7, 2014 12:00 am Updated: May 7, 2014 8:48 a.m.
HONOLULU — The security footage looks unassuming at first: a Hawaiian Airlines jet parked at a gate at the Maui airport under overcast skies, and workers going through their regular routine. Then, the 15-year-old's legs dangle briefly from the plane's belly and he drops to the concrete. Hawaii transportation officials released video Tuesday of a California teen hopping from a jet's wheel well April 20 after stowing away for a 5½-hour flight. The video, which can be seen here http://bit.ly/1niSvlb , largely confirms previous accounts given by FBI and airport officials of Yahya Abdi's seemingly unbelievable story — that he ran away from home, hopped a fence at Mineta San Jose International Airport and climbed into the wheel well of the closest plane. Abdi survived the flight at 35,000 feet despite low oxygen and freezing temperatures. The six minutes of security footage that the Hawaii Department of Transportation released show Abdi lowering himself from the Boeing 767 and jumping to the ground. He sits on the concrete for 13 seconds, then gets up and slowly walks toward the front of the plane. He wobbles slightly as he walks, pausing briefly a few times in the roughly 40 seconds it takes him to get under the passageway connecting the front of the airplane with the terminal. Abdi walks up to an airport worker driving a cart, and the two talk for about three minutes before walking away together. The boy stays standing the whole time. Hawaii Department of Transportation spokeswoman Caroline Sluyter said the footage was released after the state attorney general's office reviewed media requests. San Jose, California, police spokesman Albert Morales said the Somali immigrant flew back to California over the weekend and was being cared for by Santa Clara County Child Protective Services. Morales said in a statement Tuesday that authorities plan to work with the boy's attorney to set up an interview with him in the near future. After the department concludes its investigation, it will consult with Santa Clara County district attorney's office and city of San Jose representatives to decide whether to file charges against him, Morales said. Oskar Garcia can be reached at http://twitter.com/oskargarcia.